An outstanding addition to today's traditional or contemporary office decors. 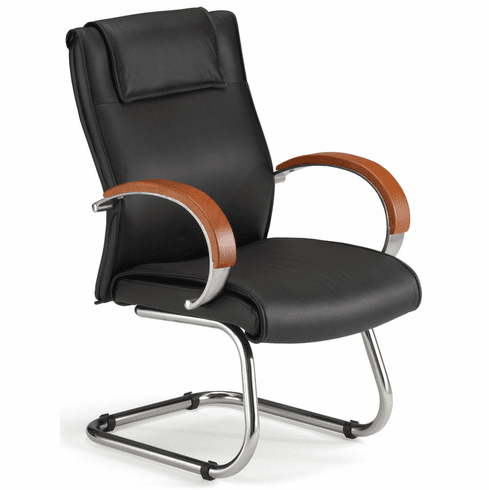 This elegant conference room chair from OFM is upholstered in genuine top grade leather with solid wood accents on the arms in your choice of either cherry or mahogany finish. Features an integrated pillow headrest atop the mid-back backrest, thick 4" padded seat for all-day comfort and a sturdy chrome finish sled base. This chair meets or exceeds ANSI/BIFMA standards. Dimensions: Seat size: 20"W x 20"D. Back size: 20"W x 22.5"H. Limited lifetime warranty from OFM. These mid back leather conference chairs normally ship within 1-2 business days from our NC or AZ warehouse.